We had to put Hansie to sleep today. He'll be buried tonight in the corner of the field behind the house. A sad day for all. Today was a good Thanksgiving. Since my daughters weren't home, I decided to invite a bunch of people who don't have family in the area or any place to go. Well. This is a Mennonite pocket in the Willamette Valley and everyone has more connections than they know what to do with. Meanwhile my sis in Yemen had so many unconnected expatriate waifs and strays in her life that she finally had to stop inviting and hope some other kind soul invited the others. One family I invited had outdoor projects to work on, one family simply declined, one girl ended up at OHSU with a horrible bone infection after surgery. But, happily, a few people could come--James whose wife is in the Mennonite home, Paul's mom, the Alexander family whose girls are friends with Jenny and gave her the cat, and Wesley who lives by himself. And then yesterday Paul's mom hinted that Uncle James and Aunt Orpha wanted a houseful as well but came up with only one person. So I invited them to all come over here, and they did, and Orpha brought her wonderful spicy Puerto Rican turkey. Their guest was Stanley, who also lives alone, and who eats turkey and mashed potatoes in a manner that makes a cook happy. Thanks to the children's help and lots of organizing and about 8 leaves in the table, we ended up with a Norman Rockwellish scene of lots of people around a long table with heaping bowls of traditional food. The new cranberry salad recipe was delicious, and no one seemed to notice that I had, in a senior moment last evening, doubled the sugar in the crescent roll dough. Then we cleaned up and sat around and talked and played games. Wesley told about the big snow of '69, Bob and Fifi talked about the cruise his dad treated them to last week, Enoch and Ben and Steven played Jenga and tried to keep the tower of blocks from falling, the girls played with the cat and dressed up in capes and carried swords and walked down to the warehouse, Stanley shared his extensive knowledge of Virginia geography, Uncle James and Paul talked about selling fescue a few days before the price went up, Matt talked about his senior project, Orpha and I discovered we had been at Calvary Bible School the same year but six weeks apart, and James H. talked about his wife's medical issues. Then we nibbled on party mix and gradually people went home. I filled plates of leftovers for the single men who acted gratifyingly grateful. The best Thanksgivings are when all my chicks are home in the nest, but maybe I need them to leave now and then so I fill my nest with other birds who need a place to go. After: Steven relaxes with the cat. Ben: If I got a ten I would start gleefully jumping up and down like a little kid. Ben: Actually I wouldn't. But I would consider it. 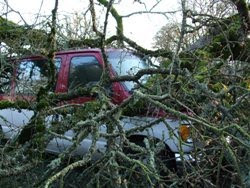 Here's a video of Paul and Duane Kropf taking the biggest limb off the van. Please ignore the triple "Are you ok?" So why did it fall? It wasn't hit by a truck--I looked for tracks. It wasn't cut with a chain saw. It wasn't due to being hollow--we had someone check it out about a year ago and he thought it was still quite healthy. It wasn't blown down in a storm; it was kind of breezy that day but not really windy. If you look at the shot of the comparatively-small root ball, you can see that not many roots were pulled up, and there aren't that many white areas where the roots were torn away. So we concluded that the roots had been gradually rotting away. The tree was heavily weighted toward the south, and most of the wind we have here (not that much) is from the south. 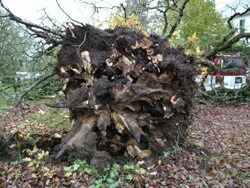 We're wondering if the mild north wind that day, plus a rotting root system, finally toppled it. I'm getting anxious to get it cut up and moved out, but Paul knows it won't go anywhere anytime soon, and it can wait until his Thanksgiving break. "How are the mighty fallen." --JK, who stopped in while I was out taking pictures. "Where the tree falleth, there shall it lie." 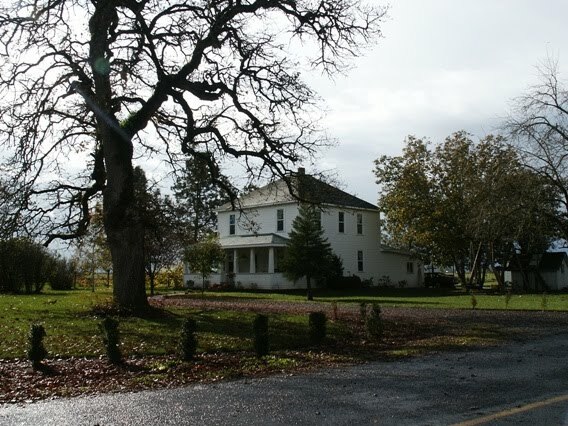 The oak tree had been there as long as anyone could remember, standing out in the front yard at the corner of Substation and Powerline Roads. Coming south on Powerline around the S-curves you first saw the gnarly branches of the oak reaching every which way, then the lights of the house filtered through the branches, and then you parked the van underneath, and then you were home. The tree was my favorite because it had character born of old age and long faithfulness and no longer caring if anyone thought it was pretty. 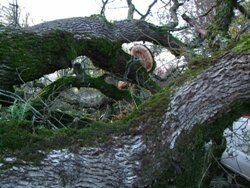 The branches were unbalanced heavily toward the south, and an occasional limb crashed in a storm. But even through the wild storm of 2002, when the power was out and I watched, certain that its end was near, the tree stayed strong and solid. 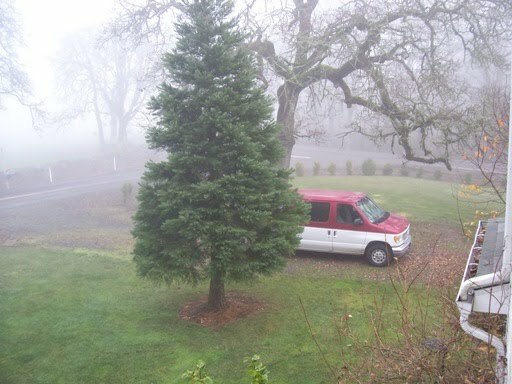 In summer, the oak tree was full and green, and every year the first signal that fall was near was when we backed the van out and suddenly heard the rattle of acorns rolling along the roof of the van. This weekend we're having our annual "special meetings" at church. I stayed home last night while the others went to the dinner at church, then I finished some work here in preparation for overnight guests, dashed out the back door, and zipped off to church thinking everything was as it ought to be. Jenny and I headed home right after the service, around 8:00. Coming south on Powerline, I rounded the curves and, as always, unconsciously looked for the lights of home scattered through the crooked branches of the oak tree. And suddenly I sensed that something was very wrong. I turned in the driveway and gasped. 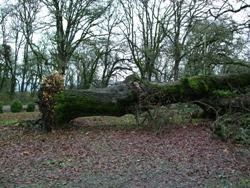 The tree was down, lying there like someone had come along and given it a gentle shove and laid it over. 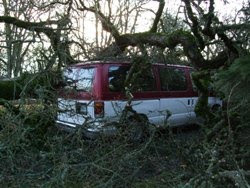 The top branches reached halfway up the sidewalk, and huge limbs surrounded the van, which looked surprisingly undamaged. It all had that awful, disorienting look of big strong things lying helpless and broken, and of an empty space in the air that should have been filled with tree, and of branches sticking where no branches belonged. And it is all very sad. I heard someone in the house [a teenage male] fussing today that Some People are just so Sad about that tree and we'll have to have a ceremony and bury it or something. Well. I'm going to be as sad as I want. It meant a lot to me, and it's gone, and there's a big empty space where it ought to be. Last Christmas I had so much fun with this, I'm going to do it again. But early, so I can use Media Mail rates, which are cheaper but take up to two weeks to get there. I'd like to give away some of my books to deserving souls and I need your help. You send me an email or Facebook message and tell me who should get a book, why they deserve one, and, if you like, which book they should get. And give me their mailing address. If I agree, I send them a book. Special consideration goes to anyone facing the holidays with extra heavy burdens--job loss, grief, illness, any struggles that make you pray, "Ok, God, really, hasn't she gone through enough now?" And of course I have a special mushy spot in my heart for young moms in these situations. You will all have the sense not to nominate yourself I'm sure. You can send me an email at dorcassmucker@gmail.com or send a message if you're my Facebook friend. Thanks in advance for helping with this. It'll be fun, I know it already. "If you still have books you would like to give away, I know that my mom would enjoy one. She. . . has multiple sclerosis. It’s been close to a year now that she can no longer walk. 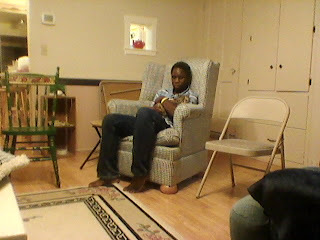 She rests around the house most of the time and I think your stories would definitely add some enjoyment to her day." Today I got a glimpse of my future unless, like Scrooge, I say, "Men's courses will foreshadow certain ends, to which, if persevered in, they must lead. But if the courses be departed from, the ends will change. Say it is thus with what you show me." Aunt Susie and I are in charge of the church sewing circle this year, definitely a first for me but I'm discovering that the job uses a number of skills I'm actually good at, such as figuring out how many quilt blocks we need for a comforter or examining a tote bag and figuring out how to make 8 more just like it. We are trying to finish up a bunch of "comforter kits." These consist of enough squares to make a full size patchwork comforter, thread to sew it, a big piece of fabric to put on the back, and yarn and needles to tie it. These get sent to sewing centers in eastern Europe, where local poor women can learn to sew and make warm blankets for their families. We were scraping the barrel for backing fabric, so when Carrie G. said she knows someone who's taking care of her mother's estate, including lots of fabric, and lets people come see it by appointment, we jumped at the opportunity, and today Carrie, Susie, and I sallied forth to shop. But first we note that when my children heard about this they said, "Mom, you canNOT buy any fabric for yourself! Only for sewing circle!" Because they know what my sewing room is like. And the attic. Because, see, I have a lot of fabric. More in the direction of my mom, who has a good roomful or two, than my Aunt Bertha, who once told Mom, "I have a lot of fabric collected too. Just look here, I have this whole drawer full!" So we went to Springfield and into this normal ranch-style house. And stood there and gaped. Tables of fabric, boxes of it, shelves of it, piles of it, rooms of it. Big pieces, little pieces, hundreds of fat quarters. Flannel, denim, quilt fabrics, dress fabrics, Christmas fabrics, fleece, t-shirt knits, and more, all neatly folded and tucked in rows. $2 a yard for the big pieces, $1 for the small. It was overwhelming. How could we ever make decisions with so many choices? "My mom bought fabric everywhere she went," said the daughter. "I have a brother in Alaska. She'd go visit him and buy fabric. Idaho, Washington, California. Portland, everywhere she went she was always buying fabric. And she sewed a lot too, but she just never got it all used up." I noticed a plastic organizer with a rainbow of lovely Gutermann thread. "Before anyone came I counted, and Mom had 750 spools of thread," the daughter told me. And this was the thing--in a fabric store, I actually like maybe 25% of the fabrics, the rest aren't my taste at all. This lady must have had my exact tastes, because I thought at least 75% of the fabric was gorgeous. As I said, overwhelming. But heavenly. Hundreds of smooth cottons and warm flannels under my fingers, colors to take your breath away, innumerable yards of rich, beckoning FABRIC. We finally decided to get a lot and share the bounty with the young moms in church who want to sew but don't have time to go shopping. Or can't afford fabric. So we picked out two bags and two boxes full. We'll let the ladies at sewing go shopping and use the rest for comforters. "I've probably sold 500 yards already, before you came," said the woman in charge. And then, yes, I just had to pick out a few pieces for myself, like a few cute fabrics with bugs for Jenny who loves bugs. And then we filled Carrie's trunk with our loot and left, and I thought about my daughters going through my stash some future fall and putting it out for sale. Horrifying. But on the other hand, just think, some future sewing circle ladies could come dig through it and have as much fun as we did today. Really, would that be so bad? "I think me and Cleo's attitudes match. We both want to be the center of attention." --Jenny. Cleo is her cat. Last night was the first rehearsal for the church Christmas chorus. Paul and I strong-armed Steven, he of the amazing talent, near-perfect pitch, and zero interest, into joining. Along with Ben, who just does these things without creating ripples. They came home. Yeah, it went fine, said Steven, but why don't Paul and I sing too? Huh? Well, because we can't sing. Oh come on. You could if you tried. I thought, how do you explain to somebody who can sing what this is like? I said, "It's like this. I can hear the music, and I can know in my head how something ought to sound, but then I open my mouth and the sound that comes out is waaaaaay different from what I was hearing in my head." Paul thought that said it pretty well. Steven couldn't comprehend this. He still thought we were just being cowardly. "I'll make a deal," I said. "I'll sing in the chorus if you write my next column for me." Paul jumped on the wagon too. "And I'll join if you preach my next sermon." Steven let it go at that. Emily called me Saturday and said she had received an email from The Writer magazine saying they mentioned her in an article in the December issue and were sending her a copy. My daughter! quoted in a writing magazine?! Like a cartoon character I levitated, whirled my legs in the air, and was off to the computer with puffs of smoke behind me. I soon found the website but sadly the articles aren't online. So today I stopped at the Albany Library, found the magazine, found the article, copied it, and came very close to grabbing perfect strangers to tell them about it. It was an article about writers who are either older or younger than the average, such as one woman who wrote a book after she was over 100. And like Emily Smucker, who wrote for the Louder Than Words series at age 18. And later it quoted Emily's advice to aspiring authors. I haven't traveled for two months, and half of my children are out of the house. Funny how other responsibilities rush in to fill any gaps in my time. I'm teaching Sunday school, VP of sewing circle, and directing the school Christmas play. Someone should write a play for school kids sometime with about 25 equal speaking/acting parts. Sigh. I guess I really should be glad they're all eager to be involved. And we all know how effective those cheerful Oh-but-even-the-guy-who-wanders-in-and-back-out-without-saying-anything-is-just-as-important-as-the-main-character speeches are. Blessings on the two kids today who said, "It's ok if I get the part and really it's ok if I don't." The play we're doing is Why The Chimes Rang. Paul's sister Rosie got copies of it back when she was teaching music and we decided it's been long enough that we can recycle it. But I felt like it was mostly narration and very little acting. So I went online and after too much digging found an old play from 1915 based on the Chimes story. So I revised it and we hope this all works. Speaking of digging too much online: for some reason I recently recalled an old song Mom used to sing. As I recalled, it went like this: In Ladabach hav' ich mein strump fuhloahda, un ohny strump gehn ich nicht heim, so gehn ich viddah tsdik, nach Ladabach zu, un koff mich un strump fah das bein"
Translation: In Ladabach I lost my sock, and without my sock I can't go home. So I'm going back to Ladabach to buy a sock for my leg. Was this an actual German folk song, or just something her family knew? Did she learn it in school, or what? I went online. And eventually, there it was, only Ladabach was Lauterbach. And on YouTube there was an old recording of Vicky the Viennese yodeler, with her rough country voice, warbling "In LaaauuuuterbaCCHHH hab' ich mein Struuumpf verloren!" Now I need to ask Mom where the song came from in her life. "You know, young man, every day you wake up with a pulse is a good day!" --a white-haired woman at Kmart, completely out of the blue, to a young man stocking the shelves. Bless his heart, he said, "Yes, you are absolutely right. Thank you for pointing that out to me." For some reason I am always surprised when one person I know knows another person or place I know. Thanks to my sister and daughter I have been in Harrisonburg, Virginia, a few times, which is a well-known Mennonite community but seems like it's on the other side of the world from Oregon and who from here ever goes there? While in Virginia I have shopped at Patchwork Plus, in the little town of Dayton, where they ought to have a stack of soup bowls by the front door so you can take one and drool into it while you shop. One time I was there and got to know Barbara Cline who runs the place, and she told me about her new book, and gave me a business card. And then some time later I hosted one stop on her blog tour. Aunt Susie and I are in charge of sewing circle this year, and last week we were working on getting comforter kits ready to send overseas with Christian Aid Ministries. Part of the kit is these square blocks that the ladies in Romania or Ukraine will sew together, and another element is a big piece of fabric for the backing. To facilitate this I had brought along the business card from Patchwork Plus because on the back it had this nifty little diagram for figuring yardage for quilt backings. So Susie and I were consulting this little card and also asking Pauline for advice. Pauline is a short, chirpy, expert quilter who loves to work hard and shows up first and leaves last. I had a thought. Pauline has a daughter in Virginia and isn't she close to Harrisonburg? And Pauline was just there for a visit not long ago. I showed her the front of the card. "Are you familiar with this place?" I asked her. She squinted. "Patchwork Plus? Where Barbara Cline is? Oh, I go there all the time when I'm in Virginia. I was just there the other week. That's where I get my quilting needles--they have extra big eyes." It's an odd feeling when something you thought was all yours, so to speak, is someone else's too. "I meet people and they're like, 'I read your mom's blog!' and I'm like 'uh, [whisper] I don't!" Today's column is about the day Paul and I went to a Beavers football game. Who knew a Beaver game and an Amish church service had anything in common? While cooking his birthday supper (his choice of menu: ham, mashed potatoes, gravy, corn, baked beans, crescent rolls, fudgy ice cream dessert) I suddenly remembered. "Oh! I forgot to post about you today!" Me: Yes. I always post about my kids on their birthdays. Steven: You mean, write about them?? Me: Because my kids are wonderful and I love them. Steven: But why post on their birthdays? Me: To show I love them, I guess. I just like to. Steven: So all the moms out there that don't post about their kids on their birthdays, they don't love them? Me: ERGH. 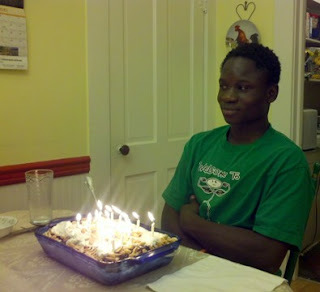 Steven, I plan to post about you whether you like it or not, because I love you and it's your birthday and that's that. Setting: fitting room at the back of Sears. Me: Ok, try these on one by one and show them to me. Steven: GAAAAAH! What did I do?? Steven: Are you sure this is ok? Steven: Am I gonna get in trouble? Me: No! If anyone comes, I'll explain. Steven [panicked]: IS THERE A CAMERA IN HERE??!! Me: NO. TRY ON THOSE CLOTHES! He and I went grocery shopping this morning. He went along for three reasons--a) to get in some driving time, b) to heft the 50-pound sacks at Cash-n-Carry for me and c) because he had some work time to get in today since he didn't do his morning chores a few times this week, and I thought helping me in town would be much more efficient than sacking seed at the warehouse. Steven's blessing to our family is that he keeps things interesting. We backed out the driveway slowly, and suddenly the car revved up and flew backwards in a quarter-circle, onto the road, and thankfully no one was coming and we didn't go in the ditch. I yelped, and Steven looked at me with big eyes. "I hit the accelerator instead of the brake." "Breathe, Mrs. Smucker, in, out." Then at Grocery Outlet I sent him out to the car with the first load of groceries while I finished paying and entered the drawing, and when I came outside there was Steven talking with a woman who turned out to also be a Luo from Kenya. We had a fun conversation and I told her we would love to come to the barbecue they host every year for the Kenyan students at the U of O. Our friend Vincent told us once that Kenyans can take one look at each other and know which tribe they're from. They must also evidently have the skill to recognize a fellow Kenyan across a parking lot in Oregon, which is rather amazing. For all that lady knew, Steven could have been from Ghana or South Africa or some other place a few thousand miles from Luo land. This sort of thing doesn't happen when I shop with the other kids, so like I said, Steven keeps life interesting. in his hand without puffing or straining at all. Here's Steven on his 12th birthday. Ben told me the other day that he could survive without the internet but what he would find really hard to give up would be just instantly looking up information. Recipes, for instance. So I'm hungry for the bread pudding they used to serve at the restaurant I waitressed at. I know they used old cinnamon rolls and doctored it up. So I can wade through all my cookbooks and call a friend or two who might know. Or I can Google "recipe bread pudding cinnamon roll" and find something similar in seconds. Last night I was going to make my old standby--tuna cheeseball and crackers--for a social event but discovered I was almost out of crackers. But I had tortilla chips. Off to Google I went and in 3 minutes had jotted down a recipe for that layered beany sour creamy dip that you put in a glass pie pan. It all got eaten up so I felt successful. Today I was finishing an article and since I have a horror of using the same words too often on one page I clicked over to Thesaurus.com at least three times and there were lists of equivalents for "contented," "knowledgeable," and "orange*," all of which, believe it or not had to do with watching a Beaver football game. *"apricot, bittersweet, cantaloupe, carrot, coral, peach, red-yellow, salmon, tangerine, titian"
Jenny loves to hear stories from my childhood and a while back I was telling her how we would play with handkerchiefs in church, turning them into twin babies in a cradle, mice, and other amazing things. I still remembered how to do the babies, but for the life of me I couldn't remember how to do a mouse. First you fold it into a triangle, then....roll in the two ends? No, that was the babies. I knew you had to somehow roll it onto itself, but how? and then gently pull out the tail, but where? Yesterday Jenny's friend Kaelin was over and happened to have a handkerchief in her purse. It turned out to be an heirloom from her grandma, possibly one that her mom and aunt played with in church. So I learned two things--some modern little girls actually carry handkerchiefs, and Amish girls weren't the only ones who played with them in church. Kaelin knew how to do the twin babies, but she had no idea about the mouse. And I had a sudden inspiration--I could Google it! So today I did, not expecting much, and there it was, step by step, just exactly like we used to do it on our aproned laps in the Amish "gma," sitting beside Mom, and on the other side, if we were really lucky, our friend Priscilla. So I'm with Ben on this--I really like to be able to instantly look stuff up. Kids, fighting loudly over Cleo: Hey, she's my kitty! No, she's mine! No, mine! Let me have her! Ooooh kitty kitty come to me! Me, muttering in background: Did I sign up for this? I don't think so. This is not what I ordered at all. Ben: What? I was a mail-order baby? Jenny: And I was a female-order baby? !